Holy Cross students wear uniforms to promote intellectual and spiritual growth in a safe non-competitive environment. Our Pastor, Principal and School Board believe uniforms provide a positive academic atmosphere during the school day. Uniforms consist of navy blue bottoms and a white or light blue shirt. We appreciate parents/guardians support of the uniform dress code, which is enforced by the principal, faculty and staff. Spirit Wear – Spirit wear consists of Holy Cross issued or approved outerwear including shirts by Holy Cross sports team, club or school- sponsored activity that has been reviewed and approved by the administration. Uniform pants are to be worn during spirit wear days. Fleece with the Holy Cross logo may also be used during the school days. Please Click Here for the Spirit Wear Order Form. Additional order forms are also available in the school office. 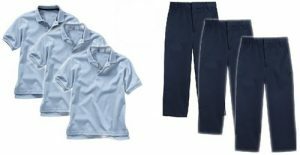 Uniform Shop – Holy Cross also offers a uniform shop where new and/or gently used uniforms can be purchased at a reduced cost. Please Click Here for the official dress code.